First off I should tell you I am a huge fan of Google+ Hangouts. The infrastructure for Hangouts provides almost all the services you get with the providers in Conducting Webinars that can Help Your Small Business on hosting Public and Private Webinars. My bias stems from being a co-host and co-producer of two Google+ Hangouts on Air and I have appeared on a few others as a guest discussing SEO and Internet marketing. The Hangouts were originally podcasts and we now have leveraged the audio portion of the Hangout by stripping out the audio and continuing to promote and maintain the podcast assets. The biggest advantages of doing your webinars using Google+ hangouts is: The cost is free. There is a built-in platform to promote your webinar on Google+YouTube with distribution that makes every public webinar available 24/7. As well, the live webinar can be loaded/embedded directly into any website or Social Network like Facebook and Twitter, or basically any place on the web can also host the live webinar. I suppose the biggest disadvantage is that in order to use the Hangouts platform you will have to be a member of Google+. If your business does not have a Google Business Page it should. Results in the Google Search Engine often include Google Local Pages in search queries with local intent. In plain English, if the searcher is in New York searching for “New York lawyers” the Google Local Business listings will usually be at or near the top position. One disadvantage of using Google+ Hangouts for a private webinar is that only 10 people can participate directly and they must have a Google+ account. I have done larger Webinar/hangouts by sharing the direct link with other private groups. The 10 people refers to the number of people that can sit on the “panel” – so it is very useful for question-and-answer webinars that any person watching live be able to ask the participants questions utilizing the Hangout Question-and-Answer App that runs as part of the the Hangout. When enabled, you will be able to take questions from anyone watching the live webinar! The tips in our blog post Tips for Having a More Successful Webinar are also useful for preparing and setting up your public or private webinar. For Google+ Webinars, the first thing you have to decide is whether it is public or private. The private options differ only in that you do not really want to promote it. This type of hangout would work best for the demo of a product or service when you do not want the distractions of a public webinar. If the 10 seats are not filled, you may want to use the Google+ Event Planner to announce the private webinar and fill empty seats on the panel. You can also send people who have circled you an email with an invitation to your private webinar. A great way to promote a public webinar is to use the event option in Google+. Once the Event is set up for your public webinar, it will give you the option of emailing your followers on Google+. In addition to email announcements, your event is posted in your events area on your Google+ Business Page. You can link to this events page to promote the event on Twitter, Facebook and other Social Networks and your website. For private Google+ webinars, you could pass the link to the private webinar via email, having a dedicated webinar page. One tip that I don’t see used often enough is to post the broadcast to a dedicated page. For public webinars, it enables you to promote your website as a the destination rather than your Google+ Business page or YouTube account. When the broadcast begins, an embed URL appears at the top of the page of the person who started the hangout. You can paste that embed code into any webpage and that loads the live webinar into the page. You can also use the YouTube URL to embed the live broadcast in a Tweet or a Facebook post. 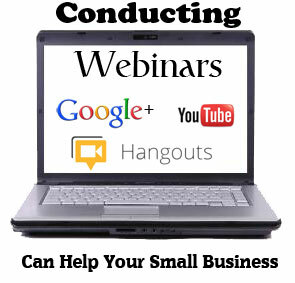 How can Your Small Business use Google+ Webinars? Because they are free, many businesses now use them – and not just for traditional purposes such as software demos and interactive meetings. Google+ webinars can be used for so many other purposes due to their almost limitless capacity for a public audience to not only watch, but participate in the webinar. I believe that the content and execution of these types of webinars is limited only by your imagination. If you can think of a use for a Google+ webinar, it will almost always be doable – making your ability to promote it the only stumbling block.